Item # 644, Steam Table Cart Carts are available for sandwiches, pretzels, popcorn, ice cream, hot foods, cold folds and general mechandise. Parks, Zoos and Aquariums and Corporate Events, outdoor modular pushcarts. When you need food or merchandise carts for your tourist attraction, park, zoo, or aquarium, you can count on the team at All Star Carts. 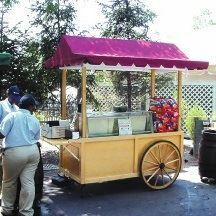 Our business offers a wide array of great snack and food carts for sale, including beverage cart selections like coffee carts. You know that people are going to be seeking food all over the place at your location, so it’s important to provide them with quality options from a high-end cart that is made specifically for your organization. Serve up sandwiches, pretzels, popcorn, and ice cream, as well as other hot and cold foods or general merchandise when you come to All Star Carts. As the leading providers of modular pushcarts, such as our coffee carts, you can rest assured that you are investing in a quality cart that is built to last. Read about our food carts for sale and place an order for a beverage cart or one of our many other selections today.